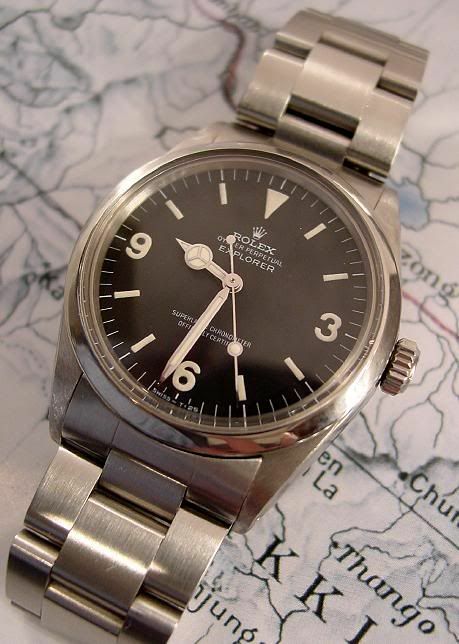 Last weekend I had a Rolex Explorer in my hands, ref. 1016 from the 70s. It was 30 years old and looked quite nice actually. The owner didn’t know exactly what he was carrying (he wanted to bring it in for resizing of the bracelet, which is quite difficult with the old style folded links Oyster bracelet) I think, because he told me before he had a steel Rolex, but couldn’t tell me the exact model name. Both links are definately worth checking out for Rolex (Explorer) fans. Another link that has to be ‘read’ is ofcourse the famous Walt Odets article at TimeZone, you can find it here. It is about a newer Explorer, and Walt Odets bashes the movement a bit :-). However, newer Explorers have another (COSC) movement inside, so at least you don’t have to feel upset if you just left the jeweler today with your new Explorer :-).